If y'all know me at all, you know I love me a Gretchen Rubin book. Since The Happiness Project I have been a devoted fan. I've loved each one of her books and I regularly listen to her podcast. So, of course, when she released a new book this week about The Four Tendencies, I had it on pre-order and read it immediately. 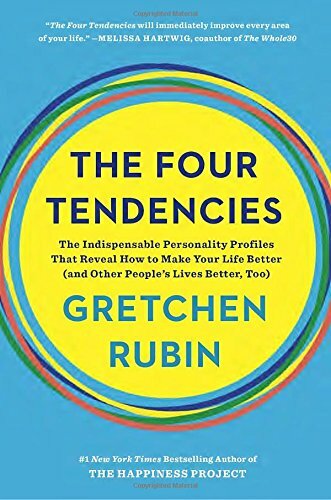 If you're not familiar with Rubin's Four Tendencies, the concept was introduced in her book on habits, Better Than Before. It's basically a personality framework that divides people into four categories based on how they respond to inner and outer expectations. Rebels - Resist both inner and outer expectations. "You can't make me and neither can I" is one of the mottos she lists for Rebels. Rebels don't like to be confined by any rules or expectations. Even if they want to do something, if someone tells them to, then they resist. Also, I think this book helped clarify a lot because I thought I knew my type from the first book but after reading more in depth in this one, I realized I was wrong. I thought I might be a Rebel because as soon as I agree to something, I don't want to do it anymore. But I realized that rebellion is not why I'm resisting. I'm an Upholder, so my inner expectations trump outer expectations. So I don't want to do something when/if an outer expectation impedes on an inner expectation. Like if my habit is that every Sunday I go to the grocery store but then I have to go to a last minute event on Sunday during that time, I get annoyed and don't want to go because I don't like changes in my routine. (See, I'm an uptight Hermione.) But it also explains why I was that student who never had to be told to do her homework. I just did it. My parents didn't have to lean over my shoulder for anything. Neither did bosses in the working world. I also can set goals for myself that no one else knows about and stick to them (which is good since I'm a writer and no one is watching to make sure I do my work.) So it's a good thing (gets stuff done) but also bad (not so flexible). In this groundbreaking analysis of personality type, bestselling author of Better Than Before and The Happiness Project Gretchen Rubin reveals the one simple question that will transform what you do at home, at work, and in life. During her multibook investigation into understanding human nature, Gretchen Rubin realized that by asking the seemingly dry question "How do I respond to expectations?" we gain explosive self-knowledge. She discovered that based on their answer, people fit into Four Tendencies: Upholders, Questioners, Obligers, and Rebels. Our Tendency shapes every aspect of our behavior, so using this framework allows us to make better decisions, meet deadlines, suffer less stress, and engage more effectively. More than 600,000 people have taken her online quiz, and managers, doctors, teachers, spouses, and parents already use the framework to help people make significant, lasting change. · People can rely on me, but I can't rely on myself. · How can I help someone to follow good advice? · People say I ask too many questions. · How do I work with someone who refuses to do what I ask—or who keeps telling me what to do? With sharp insight, compelling research, and hilarious examples, The Four Tendencies will help you get happier, healthier, more productive, and more creative. It's far easier to succeed when you know what works for you. So what do you think your type is? Seeking Novelty vs. Finding Tried and True: What's Your Style in Life? This week when I was buying yet another planner (the Ban.do Agenda in the photo), I had that moment of "you're being ridiculous." And maybe I was. I don't need another planner. And do I think I'll use that planner for the next 18 months? Hell, no. I doubt I'll use any one planner for more than three months in a row. But then I decided the hell with it because a) planners have become my hobby, b) I recently posted about not apologizing for the "silly" things you're into if it's not hurting you or someone else (or spending money you can't afford to spend), and C) This is a personality quirk. I like variety. The variety is what keeps me interested and motivated to continue planning. I get bored easily. And that's when I saw that this is an overall pattern in many areas of my life. 1. I rarely cook the same recipe twice because what keeps me excited about cooking is testing out new recipes. 2. I have trouble reading books in a series back to back (unless it's a cliffhanger book.) I need to read something else in between. 3. I never reread books, even my favorites. 4. The books I write don't follow a standard pattern even though they are in a series. I need a new concept, conflict, taboo topic, trope, setting, whatever it is to hook me into writing it. 5. Vacations - I don't want to go back to the same places all the time. The world is too big and I want to see as much as I can. But my parents love going back to the same spots and I know a lot of other people love that idea of having their same summer getaway each year. 2. Favorite movies and TV shows - I enjoy watching my favorite movies or TV shows over and over again. Every few years, I'll pull out my Dawson's Creek or Friends boxed set and watch them from start to finish. 3. My car - I'm on my third Hyundai Sante Fe. I found the vehicle I like and I'm good. And I keep my car long after it's paid off. But anyway, all this got me to wondering how other people are when it comes to this. So I want to hear from you. Do you tend to seek out variety? Or do you like finding the thing that works and sticking with it? Or does it vary depending on what area of your life? “Extraordinary.” - Kirkus STARRED review Find out more. Get the weekly round up of posts delivered to your inbox & get your FREE reading journal! Join my FB reader group for VIP Access! A reading journal designed for romance readers! Today’s book delivery! What’s in your mailbox this week? I use Canva now for my blog posts and pay for the pics (usually they’re only a dollar a piece.) It’s well worth the peace of mind. Share book reviews and ratings with Roni, and even join a book club on Goodreads. The One You Fight For is out today! 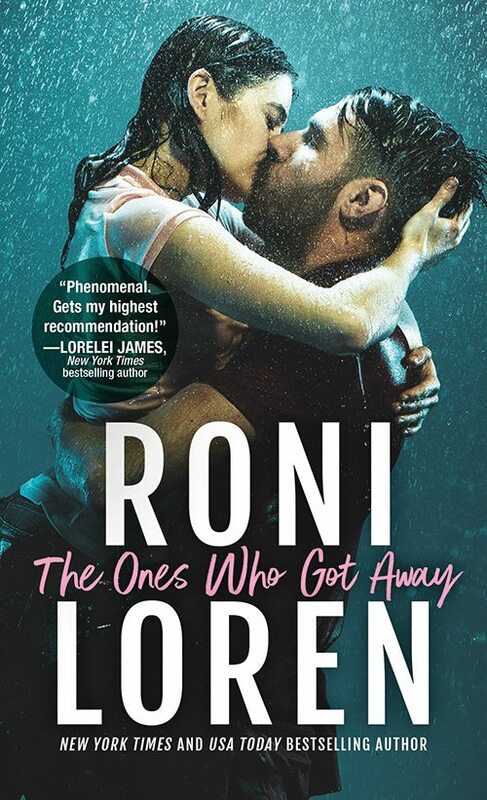 Site and text © 2008-2019 Roni Loren - Photos are either by the author, purchased from stock sites, or (where attributed) Creative Commons. Link backs, pins, and shares are always appreciated, but with the exception of promotional material (book covers, official author photo, book summaries), please do not repost material in full without permission. And though I do not accept sponsored content for this site (all my recommedations are personal recommendations), there are some affiliate links. All Amazon and iBooks links are affiliate links.